Poetry is the mist that gives form to our spirits. After an eight year hiatus poet Patti Smith has returned to recording. 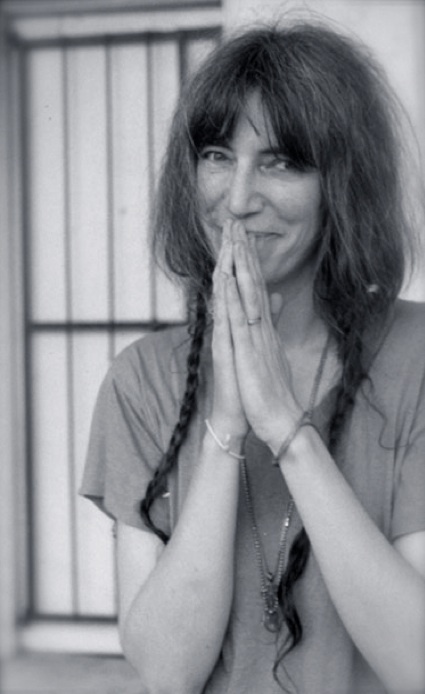 With the success of her memoir, a new album coming out in June, a European tour lined up in the summer, and her loyal and amazing guitarist Lenny Kaye having also received the Chevalier of the Ordre des Arts et des Letteres in France, these are excellent times for Patti. Hear the single APRIL FOOL and download it through iTunes. Perfect synchronicity for National Poetry month as the single was released April 1st and celebrates a call to friendship between two poets. As a child I escaped into books and music. As a young woman who didn’t fit in anywhere, I struggled to imagine a life for myself and what I might do, with not a soul in the culture to guide me to a place of belonging I could actually feel inspired by. There have been three writers in my life who saved me by showing me a new path to walk, a path different from the rest where one must be unafraid of lonely, for no artist worth anything doesn't have an acute understanding of lonely. They continue to provoke my ever-deepening love for language and poetry. The first was PATTI SMITH. I can’t begin to describe the effect she had on my life here, but will tell you I’ve been writing about Patti for a new manuscript. A tribute to her will appear on this website in May. There are a myriad of ways you can honor poetry in April. Carrying a poem in your pocket on April 26th is a fave. Maybe you'll read a poem aloud to someone you care for this month. Or think about celebrating April 8th by kissing a poet! Find more ideas and poems at Poets.org. (But... why not INTERnational Poetry Month?) I've written a new poem and will be reading it for you later (audio at the bottom of this page). Am preoccupied with sound lately, hence the BLOG page this month on Sound & Matter. I’ve been remiss at updating my site and apologize but there's just too much to do! The Middle Passage: From Misery to Meaning in Midlife by James Hollis. This memoir writing is rough work so you may not see me online much these days, too busy for Facebook and the like. I’m going in here and there to write as I feel it, and because this time I've stripped off the armor and am also working to make an honest buck, it may take time. And arnica rubs. There are days and nights when you can’t face the idea of crawling into the tunnels of your past because of stories you don’t want to relive. Yet troubling and dark as they may be, you push in with the intention of rediscovering glints of light which once guided you into future. Stars capable of admitting as much heat as a million suns; some only shining one-thousandth the brightness of one, and others, exploding like supernovae and fading away too soon. Upon rediscovering these nebulae you realize them as well worth the re-entry, and you go on, measuring mass temperature diameter and discovering that hot stars burn blue and cool ones red. Sometimes you get burned yet you go on. Science reveals its flips as your expectations of your own past present and future reveal new physics. As many times as you may tell your story, it is true that it will never be the same as you are never the same. Memory is flux as is life, although some people may tell you you never change. Stay away from those people. Weed the snakes from your garden. Navigate always toward the love. No matter how much they tell you we are born alone and die alone, it doesn’t make the need for love any less necessary to the in-between. I'd like to preface this by saying Nietzsche once observed marriage as a conversation, a grand dialogue. The first time I visited Paris, Pere Lachaise was among my burning desires of places to get lost in. I was on a mission to visit the resting places of my heroes, to walk and breathe and pause reverently in the presence of Chopin, Colette, Gérard de Nerval, Oscar Wilde, Moliere, Delacroix, Jim Morrison, Adelina Patti, Proust and dear Edith Piaf. I spent a good while searching for Gertrude Stein’s grave and finally came upon it somewhat by accident… no fan fare accompanied her grave as it did all the others. Because I expected at least a flower, some soul having been touched by this great American woman and poet who did so very much for the world of modern art as we know it, well, because Ms. Stein was all that mattered at one time if you were an artist on fire with imagination in Paris, and because there was a fine mist of rain and my companion could not give a damn, and because the grave was barren as barren can be, a sharp ache hit me. 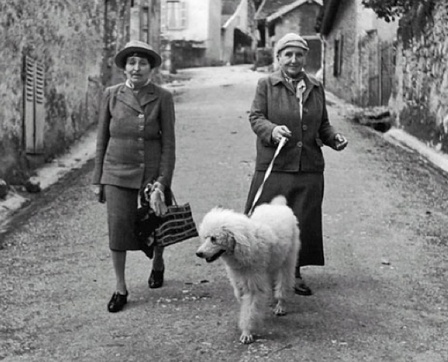 I began to search for the headstone of Alice B. Toklas. No where to be found. How awful -- to add insult to injury, no Alice! No next to or anywhere near by, no twin gravestone or hint of a riddle or rose. Gertrude resting alone? Je n'ai pas compris! Determined to correct, at the very least, the egregious wrong of her un-honored grave, I returned alone the next day with two roses for Gertrude and her missing partner. In earnest I began my search for Alice once again. I'd not thought to circle Gertrude's gravestone, like a good witch should, and as I came up behind it, I beheld the riddle. The back of Stein's tombstone bore the engraving: Alice B. Toklas, 1877 - 1967. I tend to weep when I'm at my happiest; tears, with loud solitary laughter. There they were... head to head, at rest eternally engaged in their magnificent conversation. The alchemists say, "As above, so below." A big change has occurred in our heavens; Neptune moved into Pisces for a fourteen-year stay. Neptune is the planet of poetry (!) and of dreams, inspiration, creativity, intuition, and the mystic. Neptune is exalted in Pisces where it is able to express its most lyrical, graceful, loving side as well as its illusory and deceitful sides. This position of Neptune has a way of forcing tremendous changes. Expect shake-ups in relationships, career, finances, and hopefully oppressive regimes! In fact, the last time Neptune moved into Pisces was in 1848, when the Communist Manifesto was born and the second French Revolution began. Purely physical relationships will never work during Neptune in Pisces... we all will need something far more satisfying on many levels. Not merely in love, but on all fronts. I'm concluding with my new poem, and a link to the memory of Malcolm McLaren who passed on my birthday in 2010. I used to think Malcolm was a thief, an exploiter. He was certainly a complex man with his own set of demons, doing what most artists do, appropriating. And after all, he couldn't have been that bad -- Vivienne Westwood and he were long-term partners, with glorious results. 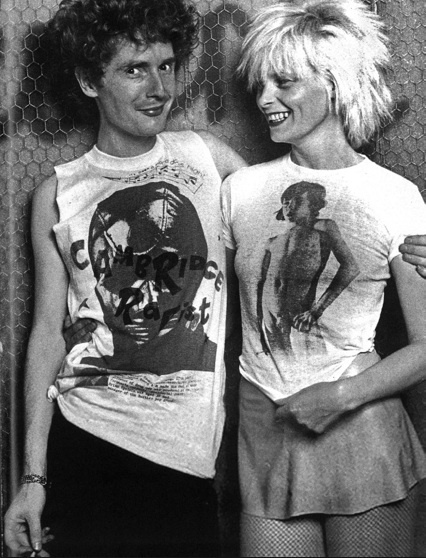 I have some karmic link with these two; Vivienne Westwood was born on my birthday (not year) and Malcolm died on my birthday. No matter the infamy, the art and the recordings he made were genius. His mixing of opera with contemporary dance beats was immaculate, as is this song from the album Waltz, Darling. A song worth waltzing to, for sure, with a little free-stylee thrown in. Not lyin', you could waltz to this tune, Viennese style. FAST TWIRLING. My friends Robby Kilgore and Maz Kessler created this music with Malcolm, and helped him with Madame Butterfly as well. It's this track I often still listen to when I need a sharp hit of joy. And finally, I wrote a new poem! Here it is, in honor of poetry month. but to name the places where the light touched down. and fingers of sunlight streaking our hair. In Pisa, we were poets together. for past and future we did not harbor. and a smile to match your shine. In Pisa, night came on yet bode no ending. while we laughed and took hold of it all.